Take a fascinating journey up the Missouri River and across the Rocky Mountains with the Lewis and Clark expedition guided by an extraordinary 17-year-old Native American woman named Sacajawea. 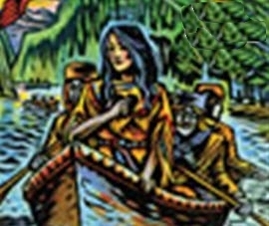 Discover how her incredible courage and backwoods know-how helped a friendly troupe of early American explorers survive in the wilderness and reach their destination: the Pacific Ocean. This rich and moving true story captures the essence of the new frontier. Themes: Stories of Native Americans, Westward Ho!